Putting a new spin on the traditional Christmas concert, ERRATICA collaborated with live music promoter and performance collective The Coveryard on a participatory music theatre event which staged an evening-long transition from winter cold and isolation, to communal warmth and festive cheer. ERRATICA’s ensemble of singers performed a staging of David Lang’s the little match girl passion, a heart-wrenching 35-minute cantata based on Hans Christian Andersen’s famous story and inspired by Bach’s St Matthew Passion. 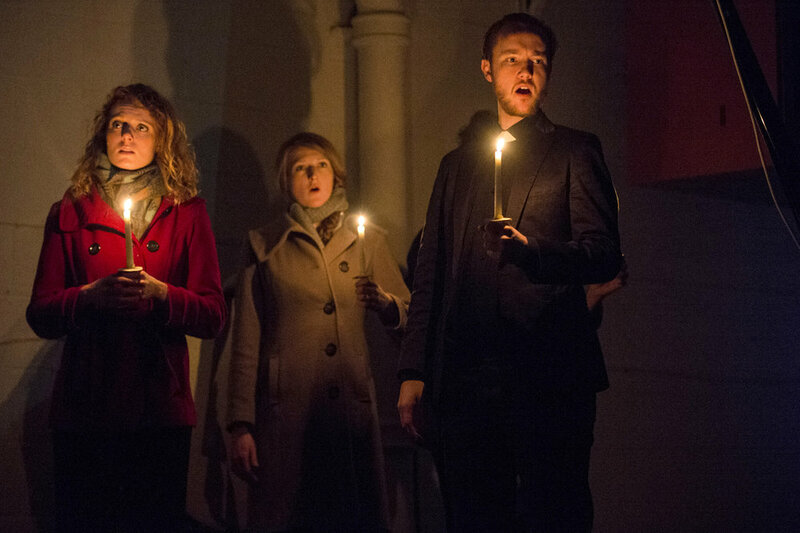 Live music promoter and performance collective The Coveryard presented KAROLAOKE, a sing-a-long performance of traditional carols, Christmas classics and seasonal pop hits, with special guests, new chamber and avant-pop arrangements, mince pies and mulled wine. This sold-out event took place at Shapes, a converted warehouse in Hackney Wick, on 11th and 12th December 2014.